5 Things to Do Over the Summer to Make Next Year AMAZING! 5 Things to Do Over the Summer to Make Next Year AWESOME! So if you’re like me… you’re just now starting to settle into to the relaxing days of Summer. But, before you get too relaxed, I wanted to share some tips with you about a few *little* things you could be doing this summer to make a HUGE difference for you in the new school year. on me… I am not here to say that you should spend your summer working. That couldn’t be FURTHER from the truth. Teachers deserve our Summer Break. We do a year and a half’s worth of work in less than a year. When you hustle like that, you need your downtime. But wouldn’t it be nice to not be so stressed at the beginning of next year? After 9 years of teaching, I’ve found a groove that has worked well for me. A little bit of work mixed in with a LOT of fun keeps me fresh but prepared for the new school year. So here are a few tips to help you enjoy your summer, but be organized for the following year. Now, I know what you’re thinking. I have to do that all school year for my improvement plans, training, PDs, and EOY Evaluations. The last thing I want to do is “reflect” One.More. stinkin’ time… but please hear me out on this. Take a few moments… while at the beach, the pool, laying on the couch, laying in bed, where ever your happy place is, and think about the previous school year. What worked in your classroom? What routine did you like? What routine do you think needs an overhaul? What subject area did you rock at this past year? What subject area did you not rock so much this past year? What do you want to change this upcoming school year for the better? Write down these answers somewhere. You don’t have to actually look at it again, but at least they’ll be there if you want to refer back to them as you complete a few of the other suggestions. Choose one or a few areas to grow. I know I didn’t rock Social Studies this year. Like at all… That poor subject just didn’t get the attention it deserved. This year I’m making the vow to put it up higher on the priorities list by working to encircle it into my reading curriculum. I also know that my clip chart did NOT work for me this year. (You can read ALL about that here) I used Class Dojo instead. That seemed to help so much more with behaviors in my classroom. But… I could never seem to find a groove with it. Students could collect points, but I always felt like I had to change consequences and rewards. I don’t like to change routines during school. It makes for a shaky, unpredictable environment for students. I need to figure out a more thought out and streamlined consequences and rewards system with Dojo. Maybe you’re a super organized person and this doesn’t pertain to you. If so, move on. If not, keep reading. The summertime is the perfect time to start organizing for the new school year. You could organize your filing system (if you’re allowed at school… #lucky) You could also organize your digital files by subject, then subsets. Another thing to consider in the ways of organizing is to fine tune your already in place systems. Maybe you’re pretty good as keeping lesson plans, but terrible with all the “other” paperwork teachers are required to keep. Read more about this lifesaver here! Or maybe last year, student data was just in stacks pushed into every corner of your classroom. Sit down and make a Student Data Binder… I PROMISE you’ll thank me every time you get called into a last minute student meeting! You can read all about making and setting up your own here. Either way, choose one or a few projects to help you get organized. Choose one that will give you the most bang for your buck. As in, one you’ve been thinking about for a while, but just haven’t had the time to do and it will pay you back from the beginning of the year ’til the end! I promise in the new year, you’ll be happy you did! Or maybe you’re more of a cerebral organizer. Sometimes just thinking about how you’re going to organize something will help you in the new year. If you’re more in the “thinking” mode… maybe start thinking about how you’re going to organize your paper system, homework, or files. As teachers, being organized means less time stressin’, so at least ponder it! This is one of those that sooo could be done lounging by the pool. Planning looks different for each teacher, but here are a few suggestions on what you could do to get a head start on Back to School plans. Lay out your units of study for the first few weeks, semester, or the whole year. One summer, I sat and aligned all our Social Studies and Science units to our Reading curriculum. I referred to the quick planning sheet all year as I moved from one story to another. This sheet is from my Curriculum Binder. But you could use an Excel Spreadsheet or table in PowerPoint. It made life so much easier because I wasn’t saying, “Ummm… what should I teach next?”, all year. Plan for the first week of school, Meet the Teacher, or Open House. This could be as simple as setting up a Pinterest board like this one I have below! You can check out this board here! Or if you want to see what else I have pinned, you can follow me here! Then, you can gather all the ideas you’d like to implement in the new school year. You could also print out one copy of all the hand outs you’d like to include and put them in a folder. Come the hustle of Back to School, you just grab that folder and throw the sheets on the copier. Focus on a Subject Area. Another suggestion for planning is just focusing on one subject area and plan it out for the next month, quarter or year. Wouldn’t it be nice to just look at those long term plans each week instead of hunting around in all your resources to plan? Team Plan! If you’re new to a grade level, or new to teaching for that matter, plan a day with your teacher team to look over pacing guides and share lesson plan ideas. You’ll feel so much better when the school year starts because you’ll at least have an idea as to what needs to be taught! Puzzles in the classroom are AMAZING! Read about this project here. Read about these easy to make center folders here! I bet you’re ready to really engage your students and keep them accountable for their learning! Summer is a great time to make up some Interactive Anchor Charts! 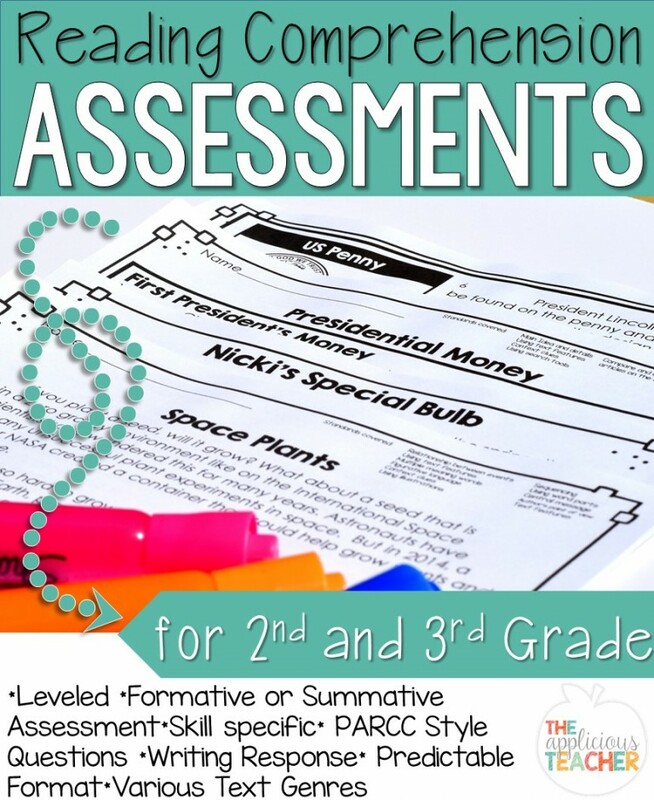 You can read all about Interactive Anchor Charts here and even grab a freebie to get started! There’s so much you could be creating to get ready for the new school year! Go back to that reflection sheet and look at what you wrote down. Is there something you could create (or buy and create) to help you with those issues? I’m an avid reader. Are you? I devour books. My husband calls me a binge reader. I’ll go a few weeks or months without touching a book, then all of sudden, I’m sucked in and reading 24/7. On the beach, while cooking, playing with my toddler, if you see me, I’ll have a book in my hand. You don’t have to be an avid reader to do this last part. Reading up on professional studies over the summer is like a “Summer Review” pack for teachers. It’s a great way to keep you fresh. These are just some MUST read books for teachers! You can read more about them here! Or maybe you’ve been thinking about rearranging your Reading block. Daily Five and Cafe are amazing places to start! You don’t have to limit your reading to just professional studies. I suggest reading for pleasure as well! Check out this MUST read list! Very comprehensive! The more you know, the smarter you’ll grow. That Dr. was so smart! And… wouldn’t it be nice to discuss best sellers at the teacher lounge table? 😉 You can check out my top 10 MUST read books for teachers here! So there are 5 things that you could do this summer to help you get a head start on the new school year. Do them all, do a few… the point is to do something. Even a little something. I promise you’ll be glad you did! What do you do to get ready for the new school year? Share your tips below! Love this post! Let's see, I organized my closet, re-did my daily -5 pacing guide, made some new editable labels and I'm also reading unshakeable. I'm putting together a book study with a few other bloggers, adventures in teaching and ela everyday. Maybe you'd like to join us? Get it girl! I love that you've done so much! Now you can come and reorganize my closet! ;] Thank you so much for your sweet invite! I'd love to join you ladies!